Area Directors who did not or will not complete their terms of office. NB: The award may in exceptional circumstances be shared between two or more Area Directors but this is not desirable. All Area Directors who fail to perform their duties. To honour and recognise the Area Director who has made a significant contribution to the goals and mission of his/her Area and District. education and training of Area officers and members. external public relations and promotion of Toastmasters. A full check list of typical activities that should be considered can be found in the District Leadership Handbook. Any Toastmasters Club that has demonstrated consistent Public Relations effort over the year – both internally to their members and externally to the public. Any club that is not in good standing. The District PR Manager will present the Award. NB: The award is a single person award and should not be shared between two or more recipients. process, procedure, idea, markets, administrative functions, marketing, educational, sales, public relations, sponsorships, etc. Should there be no recipient who has clearly made such a contribution then no award should be made and this fact be recorded on the trophy and in the hall of fame. All members of District 74 Council (ie: Cabinet, Division Directors, Area Directors, Club Presidents and Vice Presidents Education). 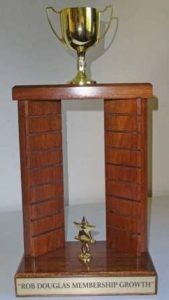 What is the Award ? When is it Awarded ? All Groups, Organisations, Teams etc. 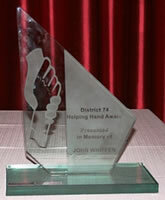 To honour and recognise a Non-Toastmaster who has made a significant contribution in the field of Communication and Leadership in the geographic boundaries of District 74. The recipient must be generally recognised by the Toastmasters and the Community as having made such outstanding contributions. For displaying outstanding Oral Communication (but not necessarily platform type) and Leadership qualities. Contributed to the benefit of the community or specific groups within the boundaries of District 74. Performed outstanding service to his/her community, state, industry etc. through communication and leadership. To honour and recognise the Division Director who has made a significant contribution to the goals and mission of his/her Division and District. There must be two or more members in the team. The teams can be from any levels within Toastmasters e.g. Club Membership Building team, Club Executive, a Speechcraft Project and many more such teams. To honour and recognise a Team of Toastmasters who have demonstrated a high level of excellence and displaying the team building and cohesiveness learnt from Lessons from the Geese. The team and their project must have made a significant contribution to the goals and mission of District 74. The recipients must be generally recognised by their fellow Toastmasters within District 74 for their outstanding contribution. All members of District 74 Council (i.e. Cabinet, Division Governors, Area Governors, Club Presidents and Vice Presidents Education). 1 July to date of the Award Committee Meeting - usually March. Any one of District 74’s Executive Team including Coordinators. To honour and recognise the Individual who has made a significant contribution to the Administration Efficiencies of the District. Contributing to or making significant improvements to the administration of some key area of District's administration. Being the spark on the Conference organising team that generally makes the conference happen. The purpose of the award is to recognise a Toastmasters Club, Team or Individual that has put together the best PR Event in that Toastmasters year. This should preferably be an event outside of Toastmasters Contests and Conferences. The recipient of the ICSA Administrator's Award. To honour and recognise a Toastmaster who has made a significant contribution to the goals and mission ofDistrict 74 and Toastmasters. Any Toastmaster who is not a member of District Executive (Area Govs, Div Govs and Cabinet). However it can be a district co-ordinator. NB: The award is a single person award and should not be shared between two or more recipients. A couple, subject to the circumstances, can be considered. No winner should be nominated again within a three year period. The purpose of the award is to recognise any Toastmaster in District 74, who has during the previous Toastmasters year given a helping hand to other Toastmasters or to District 74, by going the extra mile and doing more than was expected or necessary. This could be in the field of mentorship, membership growth, new clubs, help in getting educational achievements or late semi-annual dues in, sorting out administrative problems, contests or people problems. 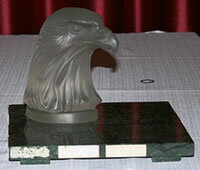 A trustee of the trust should present the award. If a trustee is not present, then the District Governor will present the award. Involvement in District 74 Affairs (e.g. Conferences and Contests). Should there be no clear winner then no award should be made and this fact be recorded on the trophy and in the hall of fame. 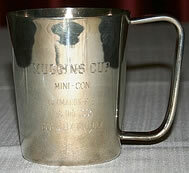 Awarded to clubs that have been Presidents Distinguished for three years in a row. These criteria are effective the 1 July, 2011 i.e. for the 2010/2011 year to be presented in October 2011. Clubs must be Presidents Distinguished in order to qualify for Top Club, but only for a single year. Points are awarded for all achievements and the Club with the highest points is awarded the Derek Waite Trophy for Top Club. In the event of a tie, the awards will be jointly awarded to the relevant clubs. As per amendment at executive meeting, May 2010. 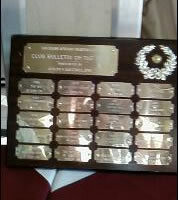 Awarded based on statistics for the greatest net Club growth by a Division in a Toastmasters year. Awarded at the May conference. Discontinued by District due to ruling by Toastmasters International restricting a District to run only 4 contests a year. The guidelines for the international award should all be covered when considering the overall criteria for this award as well. To honour and recognise a Division that has demonstrated a high level of overall excellence in the Division relating to PR matters. Here we refer to internal and external PR activities regularly executed with high levels of excellence and professionalism by the clubs of a specific Division. A Division that has created / furthered an awareness of the many benefits of TM through media contact, flyers, newsletters (printed or electronic), presentations (specialist), displays and other innovative means. A Division that has captured the interest of both members and the public at large. A division promotion or a major PR event would be an extra bonus. To honour and recognise a Club Public Relations Officer who has demonstrated a high level of excellence and creativity in promoting her/his club and Toastmasters International . Note: these criteria fall away at the end of June, 2010. They are provided for calculations for the 2000/10 year. The criteria below are based on a proposal from The Sages Toastmasters Executive Committee 2003-2004 as a result of a project presented to them by the District Governor and refined in a collective project by Cabinet members. The new criteria were unanimously accepted by the D74 Executive on 4 Oct 2003. 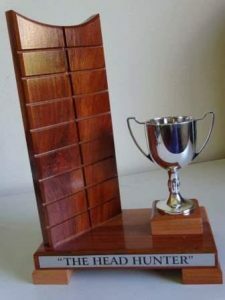 Under these new criteria, “The Derek Waite Trophy” will be presented at the October 2006 Hall of Fame after the conclusion of the 2005-2006 Toastmasters Year. The top club will be one that has the best measurable and consistent performance. The DCP is an ideal measurement tool and makes the selection criteria easily measurable and easily understood, with no subjective components and no room for misinterpretation. To be eligible for top club selection, the club must at least have achieved President’s Distinguished Club status for 3 consecutive years. There may be a number of clubs that have achieved this and thus tiebreaker elements are needed. If no club achieves President’s Distinguished Status for 3 consecutive years, then no award is made for that year. The club meeting the greatest number of DCP goals in the most recent TM year wins, e.g. Club with 10/10 will triumph over a club with 9/10 that otherwise has the same score. If there is still a tie, the tiebreaker is the inverse of the number of members, because the volume of work and the commitment increases as the number of members falls - i.e. a stable club of 21 has far more commitment than a stable club of 41 members. If there is still a tie, the tiebreaker is the number of times a club has been a President’s Distinguished Club, taking into account a five-year history as shown in the table below. If there is still a tie, the number of current District Officers in the club can be used as a tiebreaker.